As most of you probably know, today is the one year anniversary of my father-in-law’s death. In Sean’s post today, you can read a little about the bittersweet time this is for him as he remembers his Dad. My sister-in-law has a great post as well. 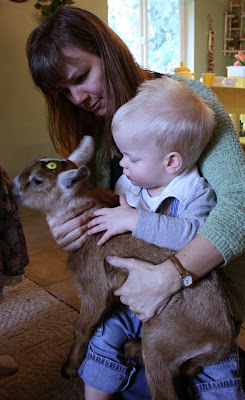 However, here at hobbsandbean, we are taking a straight-on happy approach to the memories…through goats. The goat is still dead. the vulchers would come and devower poor Gotchyer. For those of you who haven’t made the happy acquaintance, here is Gotchyer, the lovely wooden goat, in all his glory. Yes, that is what it appears to be. 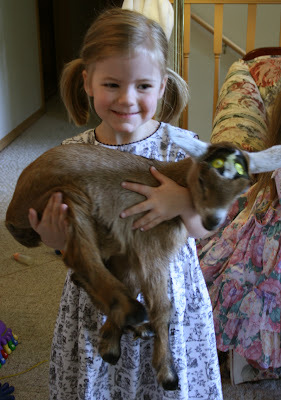 Maggie, all dressed up, holding a baby goat…inside of a nice home…at a birthday tea party. This is something I have never seen, and something I know Dad Higgins would have loved. 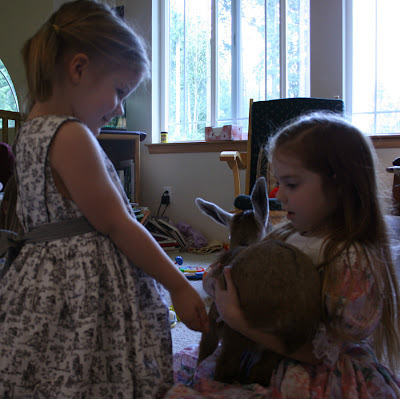 Here we have an odd hand-off…a five year old birthday girl (in a dress made poofier by multiple tutus) handing my four year old daughter a goat…which I would have thought she’d be afraid of. Nope, she loved it. Maybe that is a strong Dennis Higgins gene that is present in Mags. Calvin got in on the action too. He had an equal mix of terror and fascination. Terror of the goat’s head and fascination with the rest of it. Annie’s mom, Rhonda, is helping him be brave. 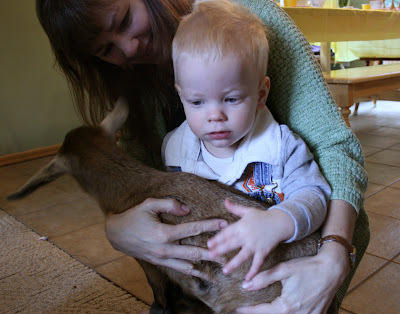 As long as the goat was looking away, things were great. I love that we have such a personal God who even set up this nice, tangible way for us to remember Dad Higgins. I love this post. Who knew there was a gene for goat appreciation? Thanks for sharing, Mo. Dad would definitely have loved those pictures.